At Frers Design we think out of the box to find solutions to 21st century issues. 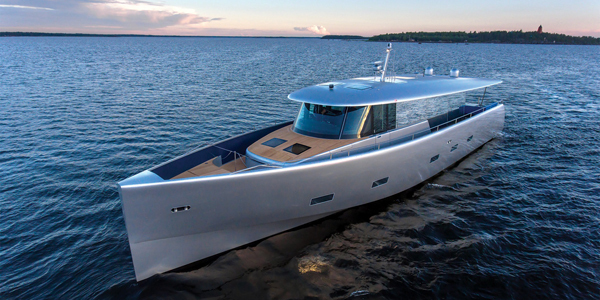 It is no longer enough to simply design a beautiful powerboat or motor yacht. The mood is to make minimal impact on the environment. That means making boats much quieter and much more fuel efficient. There are side benefits because to achieve these utopias, our designs need to slip through the water with the minimum drag and minimal fuss rather than dragging a huge wake. That makes them more seaworthy, safer – and far more comfortable. Some of these attributes are first proven in the test tank, others are gained from computer analysis and empirical knowledge learned from previous designs, and some from advanced engineering – all skill sets that are in-house. Take a look at some of our key motoryacht designs like Bill & Me, the Frers MY78 built by Baltic Yachts for an owner making the transition from sail to power and wanting the best of both worlds, and the 7m e-commuter motor boat built by Cantiere Ernesto Riva that combines the classic beauty of wood with the latest hybrid power systems and leaves no unwanted environmental impressions in its wake. And for a glimpse at the future, click on Work in Progress and view the Frers MY155 trimaran superyacht developed for McConaghy Boats in China as a comfortable performance motor yacht designed with long range cruising in mind. At Frers design, our team of experts have the flair and skill sets to translate even the wildest dreams into reality. We design motorboats from the smallest motorboats such as the e-commuter boat mentioned above up to very much larger motoryachts like Bill & Me. There is really no limit to the size of boats that we can design, and we start with an initial idea from the owner who will tell us his ideas and basic requirements. The design process for motor yachts evolves over a period of time as we produce a basic outline in accordance with the owners wishes and then strive to produce a custom motor yacht design that will far exceed his or her expectations. 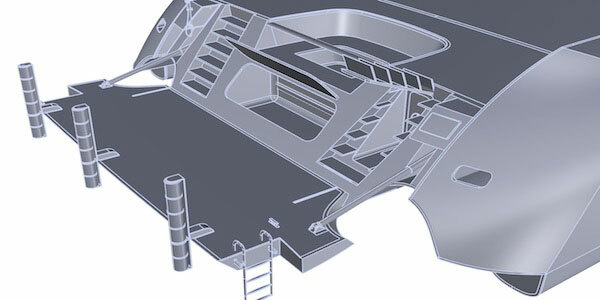 Everything about custom motor yacht design is a challenge, but at Frers Design we thrive on challenges. Some owners want classic motor boats, while others want something very modernistic and different that will mean that their boat instantly catches the eye of everyone who sees it and it will be remembered long after it has left harbour. Speed and comfort are essential today, along with environmental concerns, and at Frers our team has the skills and the expertise to produce ideas which are not just new, but creative. As a result, at any given time we may have one, two, or as many as six motor boats in build at the yards with which we work.